With a little bit of extra time and support, students at The University of New Mexico with low test scores are able to learn necessary skills to pass first-year composition courses thanks to an innovative and now award-winning program designed to eliminate courses that don’t count for credit. Designed and directed by assistant professors Bethany Davila and Cristyn Elder, the Stretch and Studio Composition program replaces the Introductory Studies-English course, a course that did not count toward graduation. 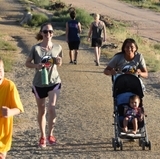 Since the first Stretch class offered in summer 2013, approximately 1,000 students have taken and passed Stretch and Studio classes, helping them move through university requirements faster. 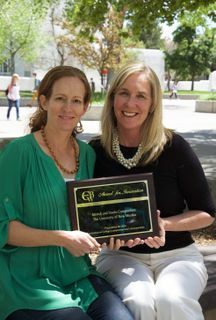 English professors Bethany Davila and Cristyn Elder were recently honored by the Council on Basic Writing in recognition of their Stretch/Studio program at UNM. “The Stretch and Studio program shows students that we value the knowledge they bring with them to UNM and that we know they can succeed in college-level writing classes with the right amount of support,” says Davila and Elder. The Stretch model, English 111/112, takes the curriculum from English 110 and stretches it across two semesters, either summer-fall or fall-spring, offering extra time for drafts, peer workshops, and feedback from instructors. The Studio model, English 113, is a four-credit hour course that requires students to meet in small groups with their instructor each week for an hour. At the annual Conference of College Composition and Communication, an award from the Council on Basic Writing was recently given to professors Davila and Elder in recognition of their Stretch/Studio program at UNM. Combined Stretch and Studio pass rates, when including student withdrawals, are approximately 90 percent; the traditional composition course pass rate is 87 percent. Over 93 percent of Stretch/Studio students pass the next required composition course. Stretch and Studio students’ reported feeling “confident” to “extremely confident” on 16 survey items related to their levels of confidence as writers, including the ability to organize and defend their ideas in writing, revise their papers, and use grammar and punctuation to clearly express their ideas. 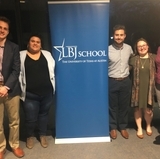 The Stretch/Studio program aims to serve as a model for other institutions that encounter increasing linguistic, cultural, and racial diversity and first-generation students.